I have recently joined a new band. I was not looking to join a new band, but fate intervened when three middle aged men were looking for a bass player and I seemed to fit the bill. We’ve had a few rehearsals now and it’s sounding great; we play mainly cover versions with some originals. On the cover version list I knew about a third of the material, had heard of a third and had never heard of the other third. I just love the fact that there are still so many great songs and artists out there unknown to me and that just a few pointers can lead you on a voyage of discovery. The two main finds for me on my musical homework were the work of Sparklehorse and the song ‘Spirit Ditch’ and John Grant with ‘I Wanna Go To Marz’. Both of these songs have some sort of otherworldly quality (no pun intended) which I loved, and working out the chords I think I worked out why this was: major/minor shifts in key. Both the verse and chorus end with a heart wrenching E major to E minor change in chords and it’s this major to minor thing that definitely does something to the brain. It is well known that in Western music, songs in a major key generally sound happy and upbeat whilst those in a minor key sound sad and mournful. (There are, of course, exceptions to the rule: ‘Alone Again’ by Gilbert O’Sullivan makes you want to throw yourself off Beachy Head but it canters along in a nice and jaunty major key and ‘Happy’ by Pharell Williams ironically takes a minor key twist in that chorus). 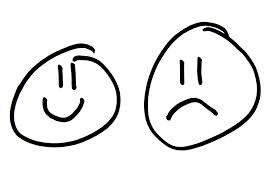 Why do we associate major with happy and minor with sad? You could argue that this is a learned response where all the songs we listen to from childhood reinforce this, along with the fact that we sing major key songs like ‘Happy Birthday’ at times of celebration and sing minor key funeral hymns at times of sadness. To challenge this, research was done by Thomas Fritz and colleagues at the Max Planck Institute for Human Cognitive and Brain Sciences in Leipzig. You can read the full paper here, but to save you an ardous job, I will kindly summarize. Basically, African natives from the Mafa tribe with no exposure to Western culture were able to distinguish happy and sad Western music when played to them (It does not say in the scientific paper whether if they played the Mafa any Gilbert O’Sullivan…). This begs the question: what brain processes are happening for this to be the case? This was answered, in part, by some more white coat-wearing boffins at Duke University, North Carolina. If you are a glutton for punishment you can read the full paper here but as we are all friends, I will give you the edited highlights. Firstly, the boffins measured the distribution of tones from about 7500 Western Classical melodies and Finnish Folk tunes (yes, that wasn’t a typo, I said Finnish Folk tunes) in both major and minor keys. After this, the remaining 31% of researchers who hadn’t slit their own wrists compared these musical intervals with those between important tonal frequencies in spoken vowels uttered by American English speakers in either animated/excited or subdued/morose voices. They found that the frequency relationships in the upbeat speech closely matched those of music in major keys, while those in the morose speech matched that in minor keys. I think I may have lost myself there, so I think we will go back to the music itself. The other musical discovery, as I mentioned, was ‘I Wanna Go To Marz’ by John Grant. Grant really messes about with the major/minor thing, flitting between the two like a vascillating butterfly. Now, bear with me folks, I’m going to give you some chords. If you aren’t a musician then try and stick with it, this should still give you an idea of how this major/minor thing affects the mood of the song. So what happens is the C minor at the end of the verse gets an uplift into a C major in the chorus which gives it that temporary ethereal quality, only to be dropped back down into the minor dirgyness of G minor on the very next chord. After the F major at the end of the first half of the chorus, your ears would expect the next chord to be a C major again. Instead we get a swooning C minor followed by a triumphant G major. Ok. So I may have lost myself again. Listen to the songs, read the bloody chords if you want to and and just sit back and enjoy. This entry was posted in Uncategorized and tagged John Grant, Sparklehorse by leonwilson12. Bookmark the permalink. Nice one, Leon. You’ve identified something I’ve always thought was key to great songwriting. I read a great interview with Bryan Ferry in Daniel Rachel’s excellent ‘Isle Of Noises’ book where he talked about his chords ‘not being major or minor’! In the jazz field, I’ve always loved the way pianists Brad Mehldau and Russell Ferrante work the major/minor thing. There’s a track Ferrante plays on a Curtis Mayfield tribute album by the Jazz Soul Seven, I think it’s called ‘It’s Alright’, where he vamps for ages on one tonic, but it’s very hard to tell when it’s major and when it’s minor… Really interesting stuff. Cheers Matt. I’m certainly no music theory expert, but the major/minor thing has always fascinated me – I just love the ‘unexpected’ chord in a song which makes you think ‘what was that?’. Glad you enjoyed it. That is a killer Matt. Although there’s only a couple of minors thrown in there, the whole chorus and bridge sections sound somewhere in between major and minor. It make the whole thing slightly disturbing. Also forgot how good Butch Vig was/is at this sort of thing.